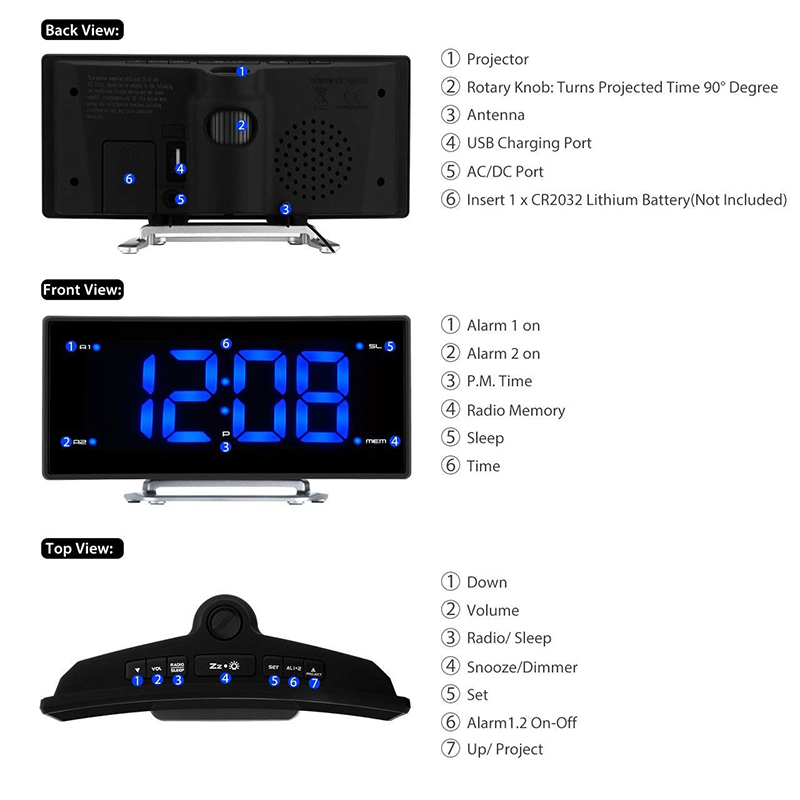 【Multi-functional】 creative and modern design make it the best gift choice on any occasions, such as used for Yoga music player, in friends party, go camping outside with family and friends, Christmas Day , Easter Day , Thanksgiving Day , Birthday, anniversary, Mothers Day , Fathers Day , Halloween , wedding, etc. 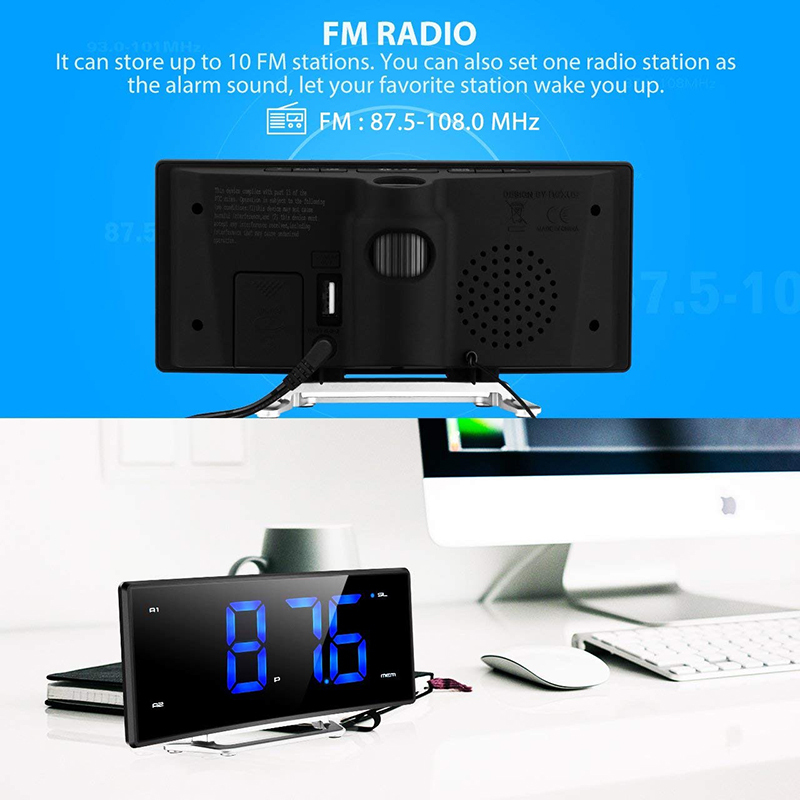 【Listen to FM Radio】 It can remember up to 10 FM preset stations (FM: 87.5-108.0MHz), allowing you to listen to music, news, weather forecast. The sleep timer function allows you to fall asleep to the radio. 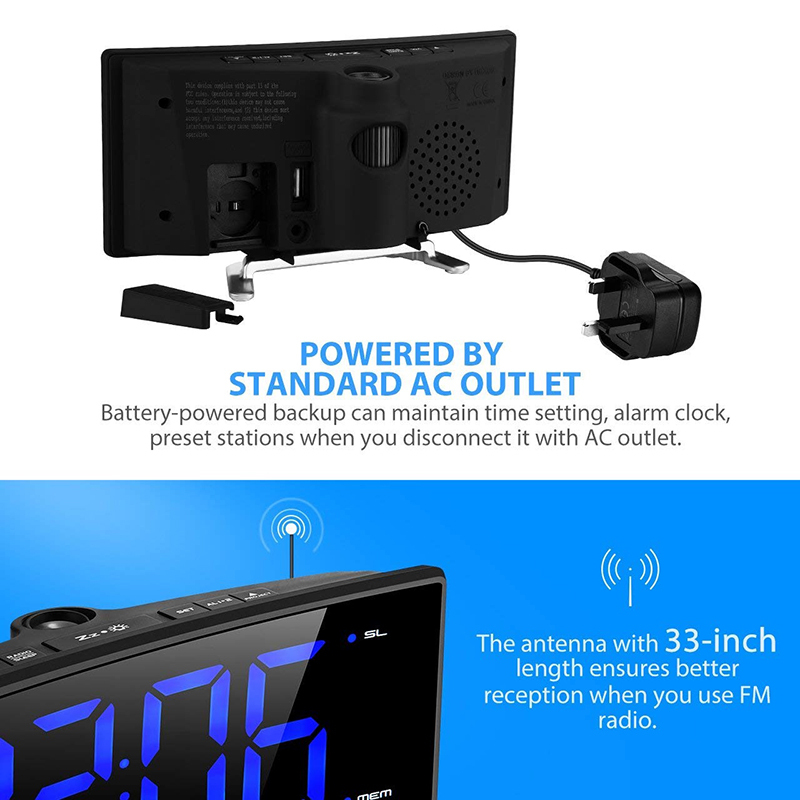 The sleep timer function allows you to fall asleep to the radio – you can set a time to power off the radio (Radio will automatically turn off after the specified time). 【Project Time Onto Ceiling】 The projector on the top of the digital alarm clock allows you to project big and clear numbers onto ceiling. You can easily see the time above rather than twisting around to see the clock when you are lying in bed. 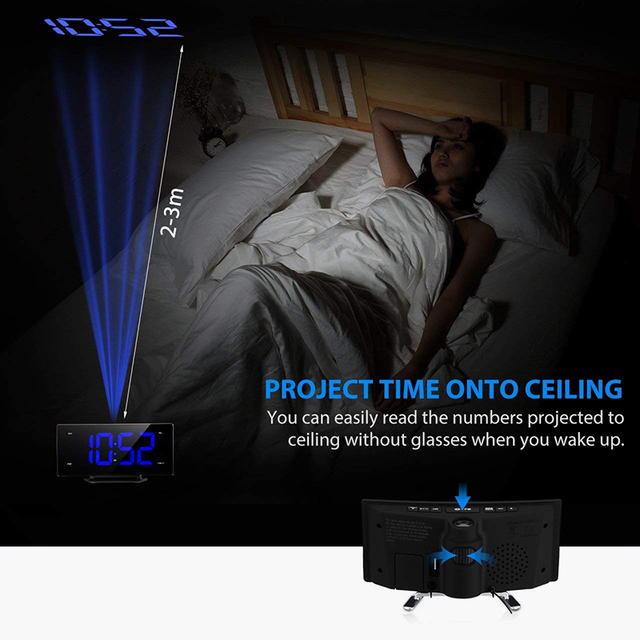 The blue ceiling projection light is soft and non-disturbing. 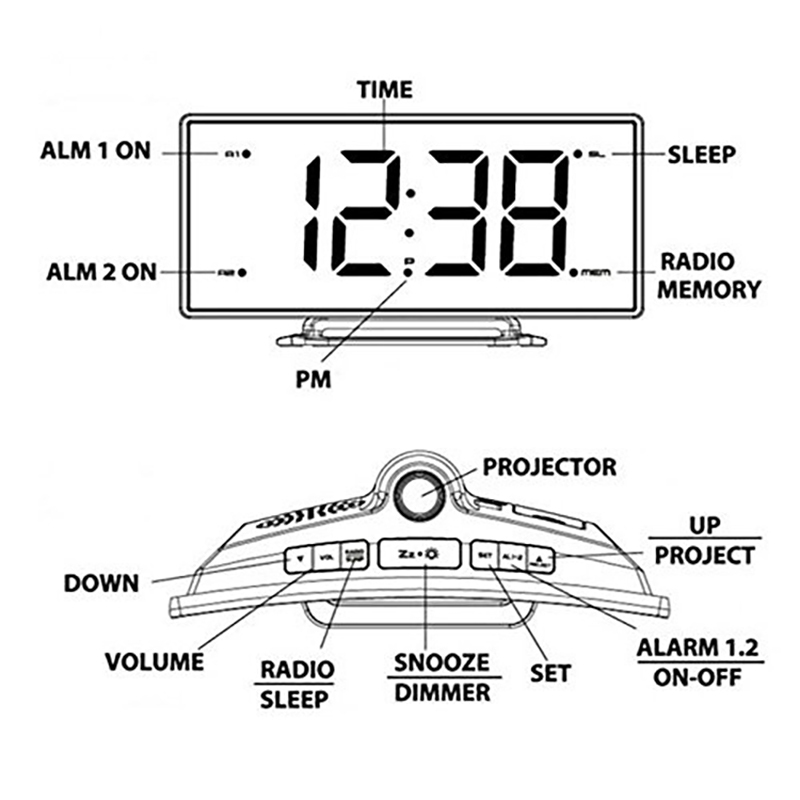 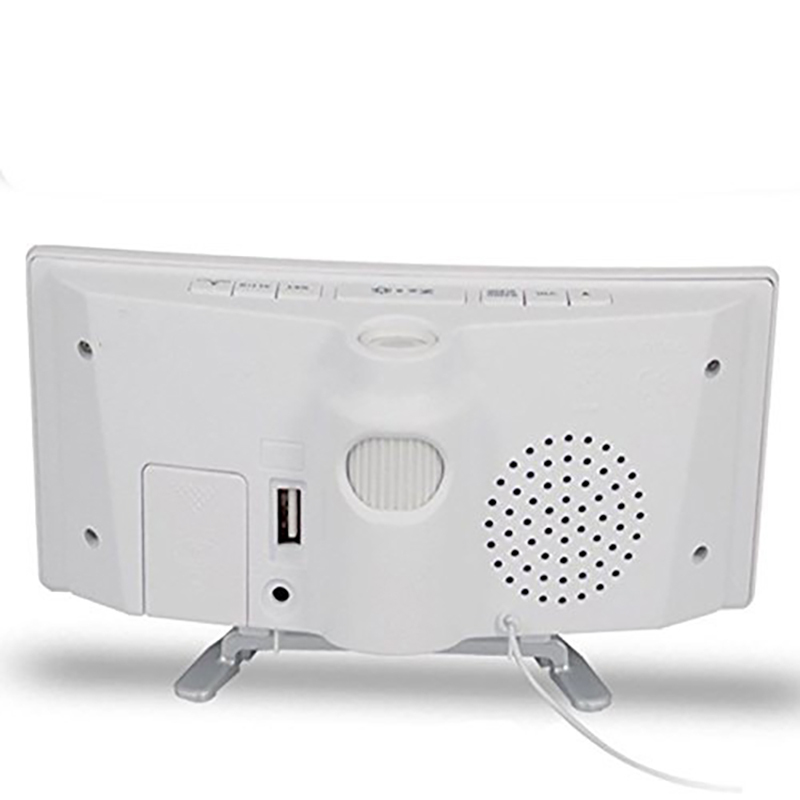 Note: You can not adjust the angle of Mpow Projection Alarm Clock to project the time onto your walls. 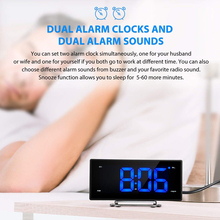 【Dual Alarms and Dual Alarm Sounds】 The dual alarms make it possible to set two separate wake-up times when you and your partner go to work at different times. 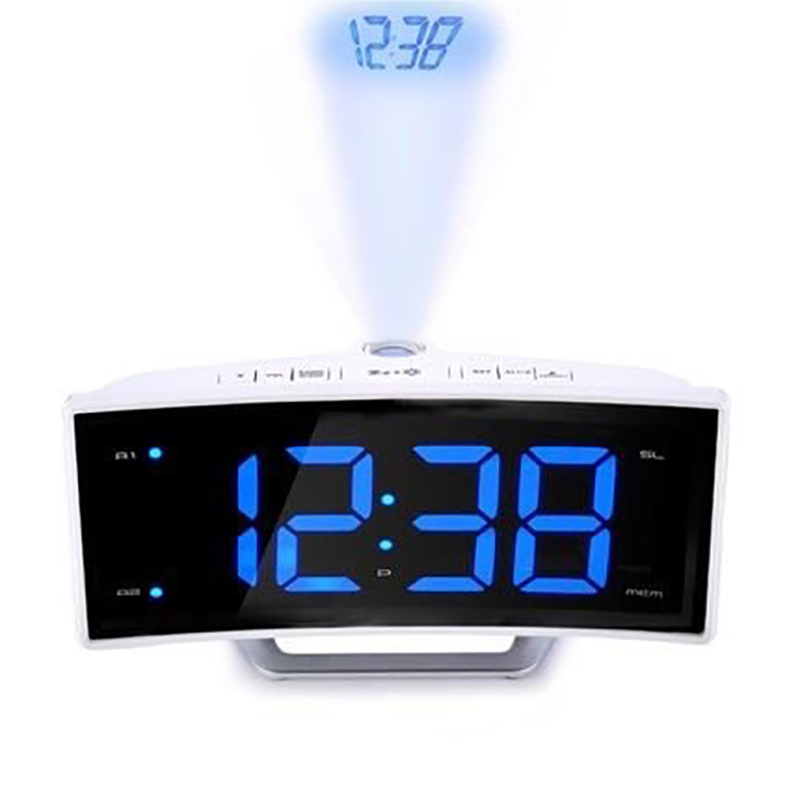 Snooze function allows 5-60 extra minutes of sleep before alerting you again. 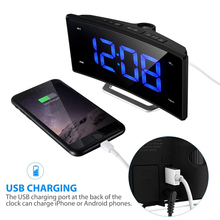 【USB Port for Charging Cellphones】 5V 1A USB output interface at the back of the clock allows you to charge iPhone or Android smartphones easily, which avoids drained battery while you are sleeping and allows you to be ready to go when you wake up. 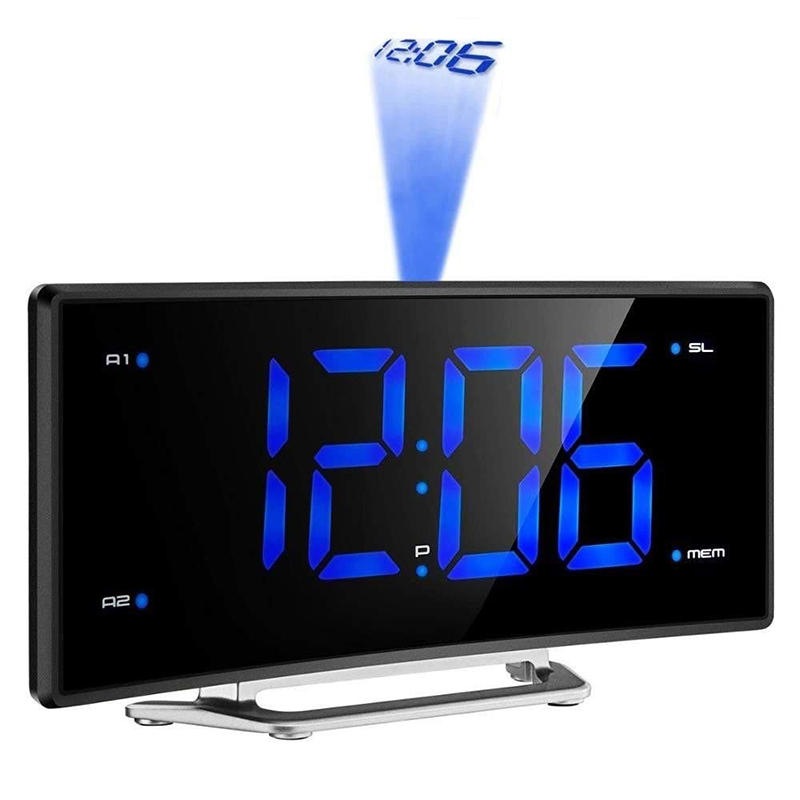 【2-inch Arc-shaped LED Display with Dimmer】 The blue and big numbers on the large display are easy to read from a far distance and it has 3 brightness levels: bright, dim, off. 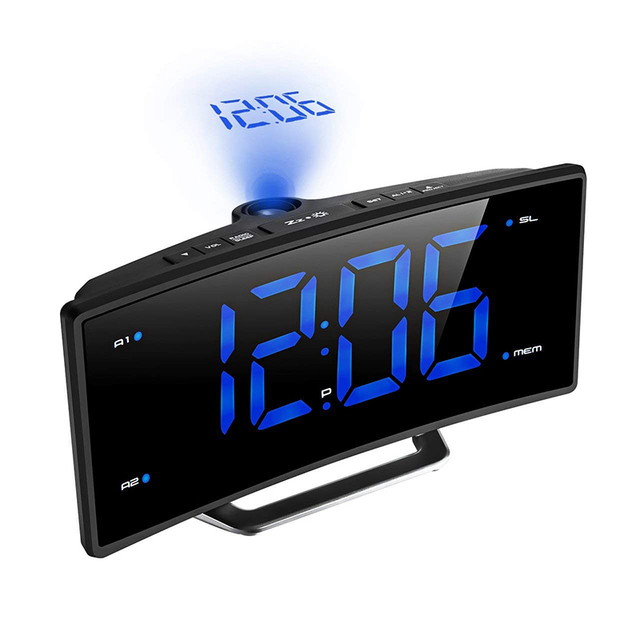 The adjustable dimmer enables you to set the display to a brighter setting in daytime and softer one at night. 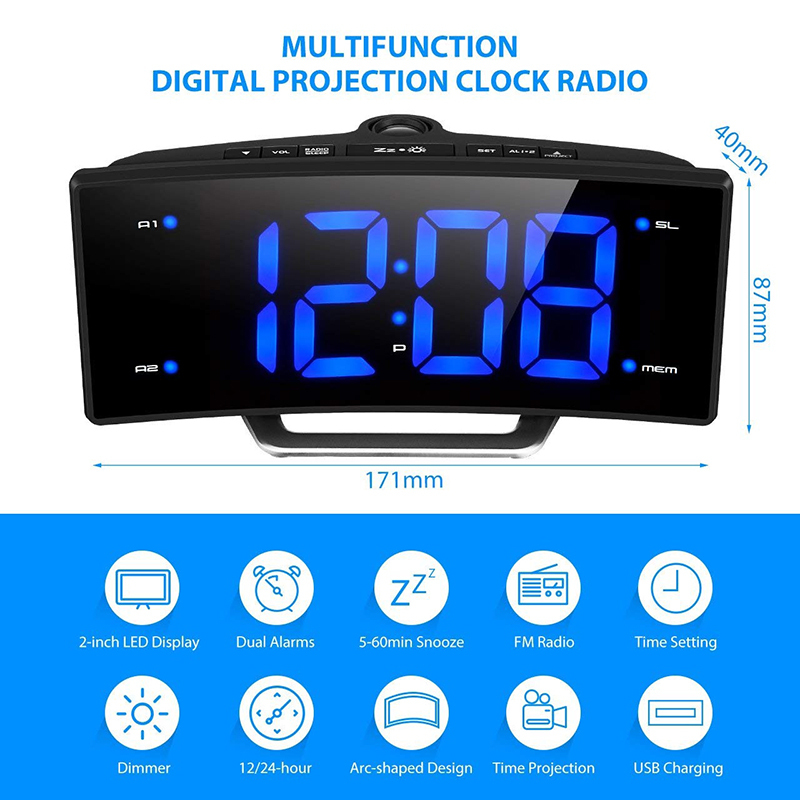 You can also turn off the display and leave the projection on. 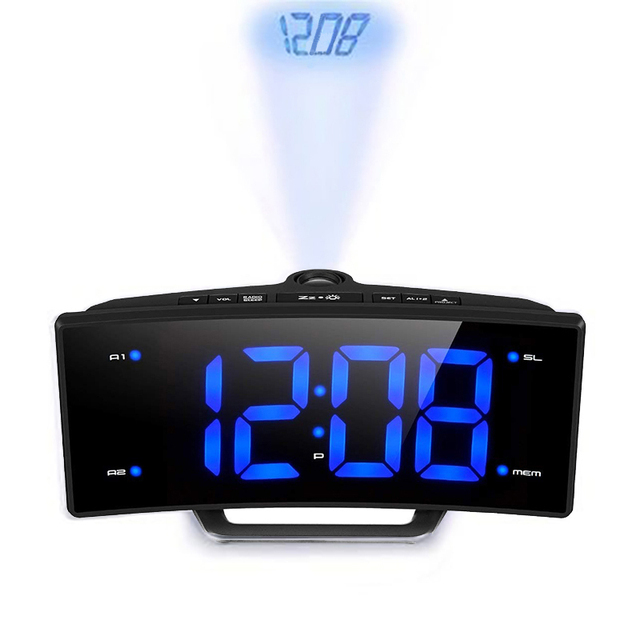 Arc-shaped LED display allows you to see the time from multi-angle.Shine bright all night,you can turn off the projection of you do not want.